We set sell from Ushuaia after dinner on Friday night, next stop the Shetland Islands North of Antarctica. We put our sea sickness patch on, in anticipation of a potential rough ride through the Drake Passage. It’s the most violent sea crossing in the world. Guidance says you will either get the “Drake Lake” and a smooth ride or “The Drake Shake” and a very rough ride. So far we have been very lucky and it’s been smooth, minus some pitching side to side from 1-4am. I got an ok sleep, but trying to get comfortable as you rock back and forth in your buck, makes it difficult for a consistent sleep. The meals have been good so far, having tested out dinner, breakfast and lunch. It will be welcome to fuel us and revive us each day. We had to education talks from the ships Polar and Marine experts today. Lynne (originally from Australia) walked us through the history and lessons of Antarctica. She showed us how mammals and plants hibernate and migrate to cooler and warmer climates. Antarctica is the only place in the world where all the Oceans meet from East and West and part of why the Drake Passage is so rough. Migration from Antarctica by mammals or birds must happen by flight or sea. The way water flows clockwise around the ice mass, plants or seeds would float around the island not catch on to it. Now for food, Krill fish are a plenty and provide lots of nutrients for birds, seals and whales. They are more the foundation for life on Antarctica, it is what holds the whole ecosystem together. The food sources available and not available are the main reasons humans can’t survive without bringing their own food supply. Theoretically we could live on Penguin eggs and seal fat for 1-2 years, but never really being able to survive the elements and colonize. 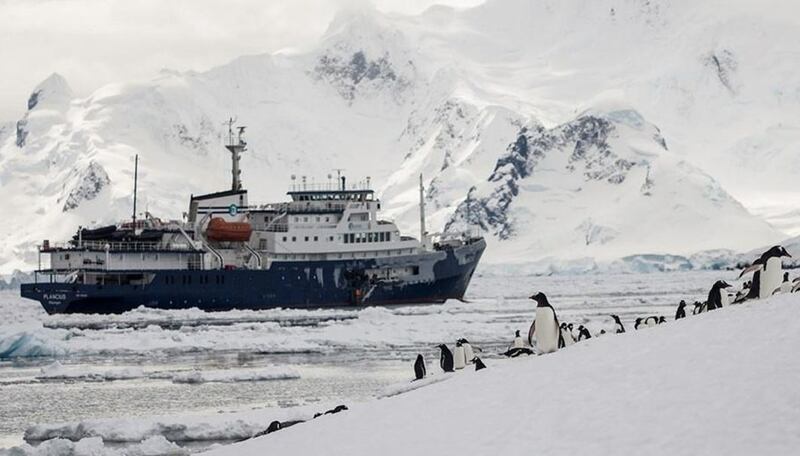 The lowest ever recorded temperature on Antarctica is -82 C and with wind chill -110 C! “Ant” Arctica is the opposite of the arctic which means polar region. Ant = Opposite. In the afternoon, Michael who specialized in on the mammals shared some education on Polar Bears. He shared how Polar Bears, Polar Foxes and Polar Wolves survive and thrive in the region. They all sport white fir, with the Polar bear having three layers of translucent fir to best pull in the heat energy from the sun. Polar bears unlike other bears do not hibernate. They only dig into dens to ride out extreme weather or for females to bare cubs. Usually we start the race right away. Since we have 2.5 days’ voyage to get there, it’s a nice warm up to catch up with friends from previous races and get to meet new people. It’s an incredible collection and community of runners from all over the world representing every continent. There are pro runners, to people tackling multiple events in the same year, to adventurers of all ages, up to the oldest being a 72-year gentleman! By the time you get this email, we will be out on course on day one. Rumor is they want to get as much mileage on the first day, in case of harsh weather coming in. We could be out there 8-15 hours! Ankle is getting stronger day by day. Still have a little instability left to right, and will wear the brace out there for the first day. As our expedition leader shared with us yesterday, ice and weather rule the universe out here and we must follow, be patient and flexible. In addition to wearing many layers, a positive attitude and a resilient mindset will be critical. otherwise, all posts will go here below! Last Desert Race site blog (above). to share after Day 1!